Here’s how much the out-of-pocket costs of premiums would rise in your state. The GOP’s plan to repeal and replace Obamacare is facing a precarious future. A vote is supposed to happen sometime Thursday in the House of Representatives, but it’s still unclear what the bill will actually look like, with moderates and conservatives in the Republican caucus revolting Wednesday night and threatening to withhold their support. There’s a good reason why some Republicans aren’t clamoring to throw their support behind this bill: In its current form, the bill could leave much of the country with higher insurance premiums, especially for older, rural voters. The Kaiser Family Foundation has been running the numbers on the proposal, and it paints a grim picture for much of the country. Under Obamacare, people receive subsidies to reduce the cost of their insurance. These subsidies are based on income, age, and the cost of premiums in their area (which can vary widely). The law guarantees that for people under a certain income level, their personal costs will be capped at a level related to their income. The GOP plan, on the other hand, hands out refundable tax credits based solely on age—with no differentiation for how much someone makes or how much premiums cost in their area. The Republican bill could result in many people paying a much higher percentage of their income on insurance coverage than they would under Obamacare. 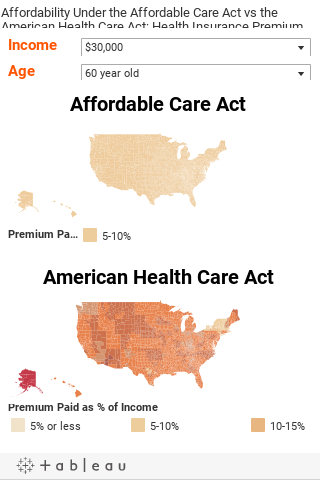 This map from Kaiser shows how much the average 60-year-old making $30,000 would end up paying for health care under the GOP. Under Obamacare, this group of people would never have to pay more than 5-10 percent of their income on premiums. If the GOP bill passes, this group could end up paying out huge sums of money—for example, a 36 percent increase in Ramsey County in Minnesota, or 48 percent increase in Houston County in Texas, according to Kaiser. Republicans have recognized that this is a problem. Earlier this week, the House included an extra block of funding to help lower health care costs for people between 50-64. But instead of detailing how exactly they plan to lower those costs, the House simply threw up their hands, earmarked the funding, and told the Senate it’s up to them to figure out a solution.